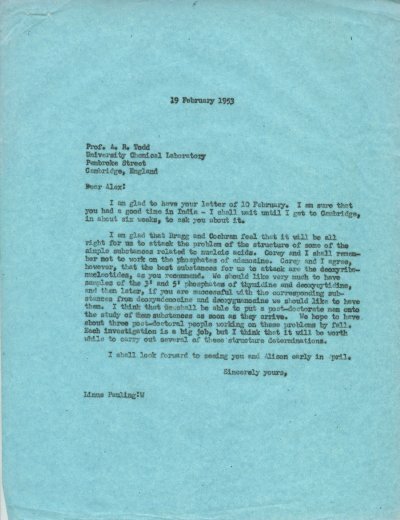 Letter from LP to Henry Allen Moe, Guggenheim Memorial Foundation, RE: enclosed is LP's report on the biochemistry prospects for fellowships. He briefly discusses a student's (Aronoff) politics. [Reply from Moe to LP February 27, 1953]. [Filed under LP Science: Box 14.015, Folder 15.1]. Macmillan & Co. Ltd., St. Martin's Street, London, W.C.2. for	2 1 FEB 1953. WE have formulated a structure for the nucleic acids which is compatible with the main features of the X-ray diagram and with the general principles of molecular structure, and which accounts satisfactorily for some of the chemical properties of the substances. The structure involves three intertwined helical polynucleotide chains. Each chain, which is formed by phosphate di-ester groups and linking (β-D-ribofuranose or β -D-deoxyribofuranose residues with 3', 5' linkages, has approximately twenty-four nucleotide residues in seven turns of the helix. The helixes have the sense of a right-handed screw. The phosphate groups are closely packed about the axis of the molecule, with the pentose residues surrounding them, and the purine and pyrimidine groups projecting radially, their planes being approximately perpendicular to the molecular axis. The operation that converts one residue to the next residue in the polynucleotide chain is rotation by about 105° and translation by 3 ·4 A. A detailed description of the structure is appearing in the February 1953 issue of the Proceedings of the National Academy of Sciences of the United States of America. Gates and Crellin Laboratories of Chemistry, California Institute of Technology, Pasadena 4, California. Jan. 2.